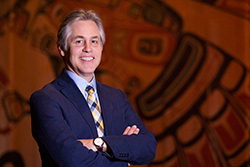 A public lecture by Professor John Borrows, Canada Research Chair in Indigenous Law, University of Victoria Law School, British Columbia and 2018 Institute of Advanced Studies Visiting Fellow. Despite centuries of colonialism, Indigenous peoples around the world are rebuilding their nations through processes of cultural and material rejuvenation. Central to that task of rejuvenation are efforts by Indigenous communities to revitalise their languages and laws. While the revitalisation of Indigenous language and law are often considered as separate processes, in this lecture, Professor John Borrows will consider them together. What is the role of Indigenous languages in learning law from the land and in rebuilding Indigenous nationhood and governance? And given the impact of colonialism on Indigenous languages, how can they serve to strengthen Indigenous laws today? Professor Borrows will answer these questions by attending to the revitalisation of Indigenous laws across a range of domains, from Indigenous constitutional law to dispute resolution and leadership practices. John Borrows B.A., M.A., J.D., LL.M. (Toronto), Ph.D. (Osgoode Hall Law School), LL.D. (Hons., Dalhousie & Law Society of Upper Canada) F.R.S.C., is the Canada Research Chair in Indigenous Law at the University of Victoria Law School in British Columbia. His publications include, Recovering Canada: The Resurgence of Indigenous Law (Donald Smiley Award for the best book in Canadian Political Science, 2002), Canada’s Indigenous Constitution (Canadian Law and Society Best Book Award 2011), Drawing Out Law: A Spirit’s Guide (2010), Freedom and Indigenous Constitutionalism (Donald Smiley Award for the best book in Canadian Political Science, 2016), The Right Relationship (with Michael Coyle, ed. ), all from the University of Toronto Press. He is the 2017 Killam Prize winner in Social Sciences. John is Anishinaabe/Ojibway and a member of the Chippewa of the Nawash First Nation in Ontario, Canada. Professor Borrows is a 2018 UWA Institute of Advanced Studies Visiting Fellow. This talk is co-sponsored with the UWA School of Indigenous Studies.